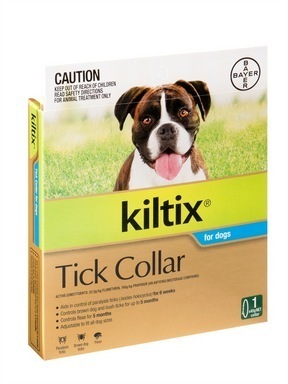 Kiltix Tick Collar is manufactured by Bayer Australia Ltd. The collar is worn continuously around the animal's neck and disseminates the parasiticide throughout the animal's coat as the animal moves around. It may take up to 1 week for an effective dose to be disseminated into thick double coated haired areas of the coat. Daily tick checks are still recommended in conjunction with use of the tick collar to increase the effectiveness of tick control. The area of skin on the neck around the collar should be monitored for any signs of irritation and the collar removed if irritation is noted. The Kiltix Collar resists the effects of water but should nonetheless be removed for bathing. Frequent bathing or swimming may remove the product from the coat, thus reducing the effectiveness of the product in flea and tick control. The Bay-o-Pet Tick Collar is placed around the dog's neck and left on continuously for the effective period of the product - that is 6 weeks for paralysis tick control; 5 months for flea control; 5 months for control of the brown and bush tick. The product should be removed from the packaging, unrolled and the plastic removed from the smooth inner side prior to placing around the animal's neck. The free end should then be pulled through the clasp and tightened to the desired length around the dog's neck. The product comes in 1 size, a 45g plastic resin collar. Flumethrin 22.5 g/kg, propoxur 100 g/kg. Both these active ingredients act on the nervous system of the targeted parasites. Do not allow pets to chew on the collar. Do not use in conjunction with any other parasite product containing anti-cholinesterase ingredients. Do not place on sick or convalescing dogs. Do not use on puppies under the age of 3 months. Observe the skin around the collar regularly when first worn to check for signs of irritation. If irritation occurs discontinue use immediately. If poisoning occurs seek veterinary attention immediately or contact The Poisons Information Centre.